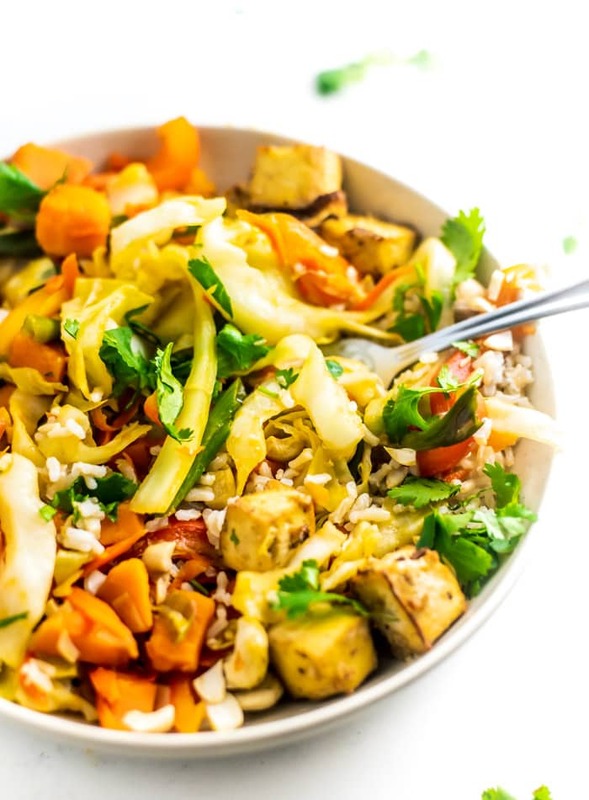 This vegan sweet potato cabbage cashew features everyday ingredients such as carrot, cabbage, sweet potato and tofu for a simple, filling, healthy plant-based meal. Tofu. You’ll need medium, firm or extra firm tofu to make this recipe. 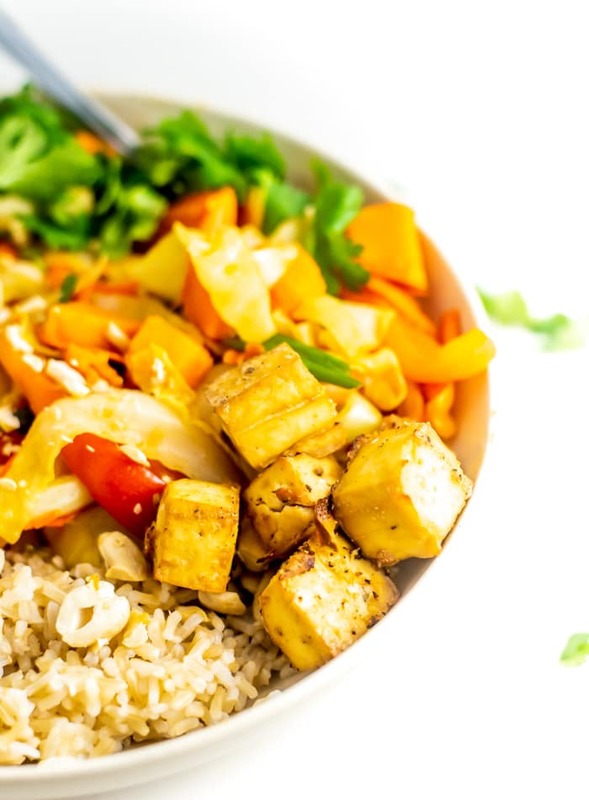 You can either bake the tofu in the oven while you cook the rest of stir-fry or pan fry it before cooking the rest of the dish. Both options work great and just depend on whether you feel like turning your oven on or not. I tossed the tofu in cornstarch before baking to give it a little extra crisp. For an even better result, press the excess water out of the tofu by wrapping the block in a dish cloth and placing a few heavy objects (such as cookbooks) on top of it for 30 minutes. Sweet Potato. You’ll need one medium sweet potato, peeled and cut into small pieces. This will go into the pan first so it can cook before adding the rest of the veggies. Shoot for small cubes so it doesn’t take too long to cook. Cabbage. I used green cabbage for this recipe but you could also use napa or savoy cabbage. I used a small whole head of cabbage or about 4-5 cups sliced. It doesn’t have to be an exact amount. Carrots. You’ll need 2 medium sized carrots or about 1 cup grated. Bell pepper. I used 2 thinly sliced red bell peppers in this recipe. You can use any colour of bell pepper. Quick stir-fry sauce. I made a quick stir-fry sauce using soy sauce, pure maple syrup and hoisin sauce whisked together in a small dish. The sauce will be reserved right until the end of cooking. Cashews. 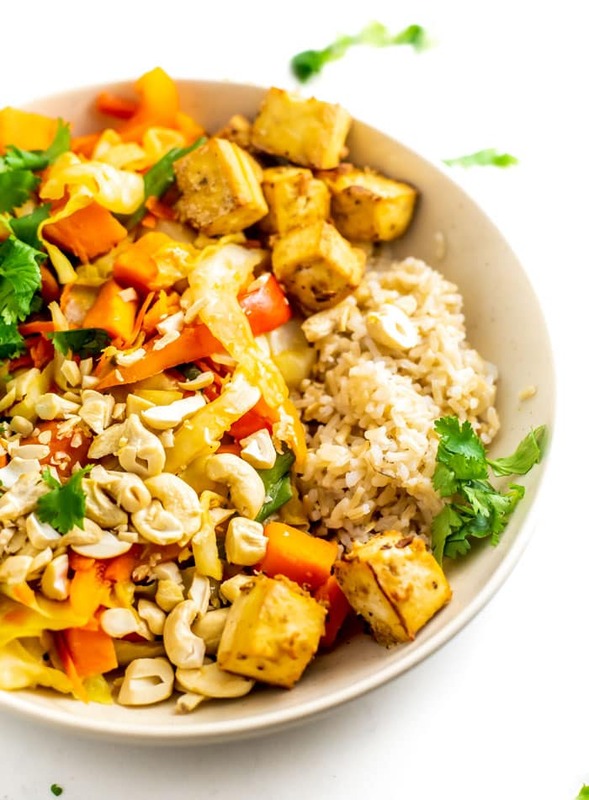 You’re going to need some cashews for this cashew stir-fry, obviously! I used raw cashews but dry roasted would also be suitable. Just watch they don’t have added oil. I like my cashews a little soft in stir-fries so I added them right into the stir fry to cook with the veggies. If you like them crunchy, you can reserve them until the end and use them as a topping. I used 3/4 cups raw cashews in the recipe. Green onion. The green onion can go in with the rest of the veggies or be used as a topping. I love stir-fried green onion so I added them in with the rest of the veggies. You’ll need one whole bunch of green onions chopped into 1 inch pieces. This simple, delicious stir fry is quite easy to make. 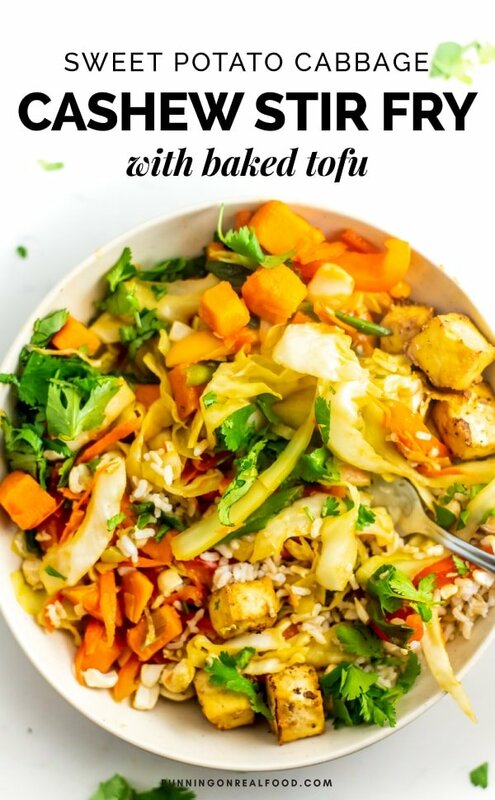 Start by getting the tofu in the oven and while it’s cooking, chop the veggies, start cooking the sweet potato, then add rest of the ingredients, cooking everything up, adding the simple sauce and digging in. Serve on its own or over a bowl of brown or jasmine rice or your favourite noodles. Serve with plenty of fresh chopped cilantro. This recipe is oil-free, vegan and can be made gluten-free if gluten-free hoisin and tamari are used. 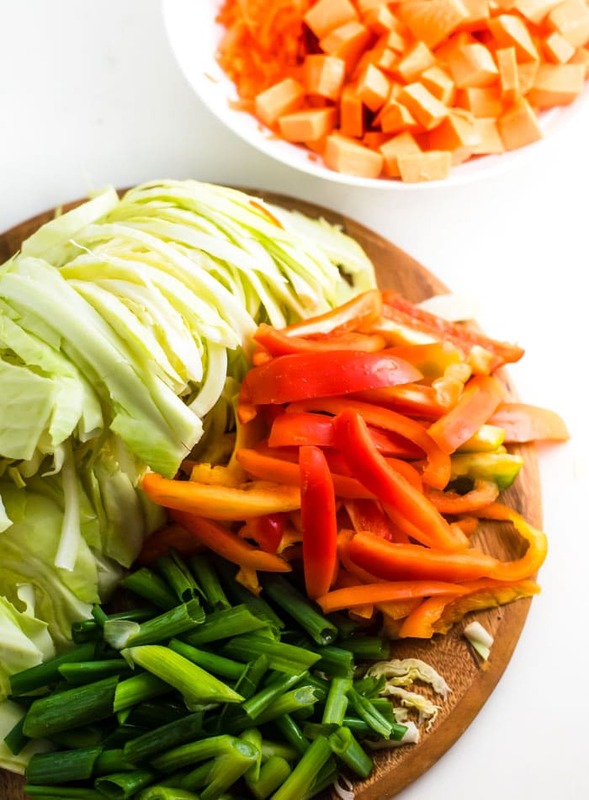 With a whole head of green cabbage this big veggie stir fry is sure to fill you up. 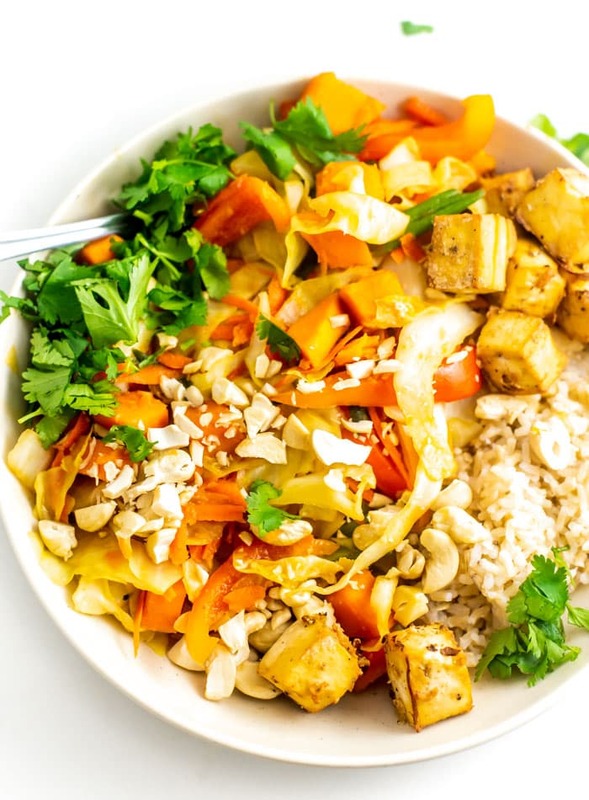 Enjoy this delicious cashew stir fry on its own or served or noodles or brown rice. 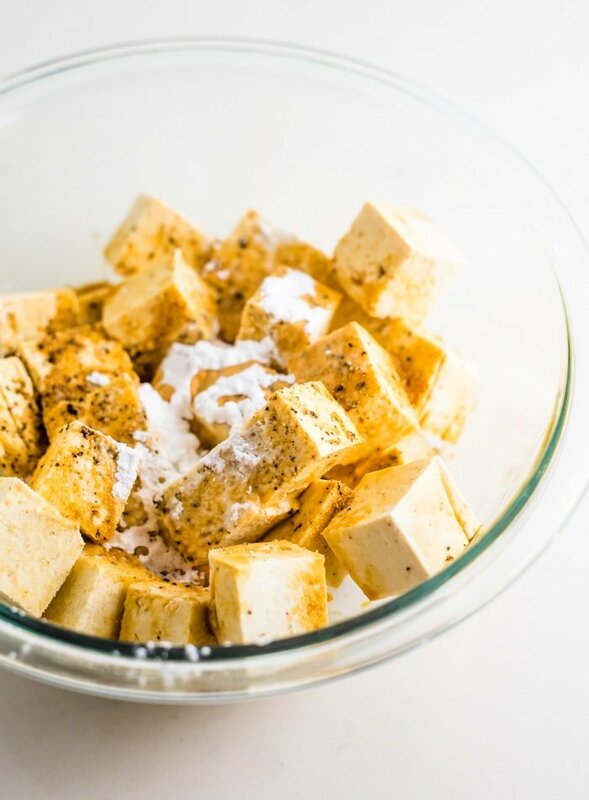 To make the tofu, preheat the oven to 400 degrees F. Cube the the block of tofu and place in a bowl. Add the soy sauce, cornstarch, garlic powder and black pepper and toss to coat. Place the cubes of tofu on a baking tray and bake for 30-40 minutes until browned. 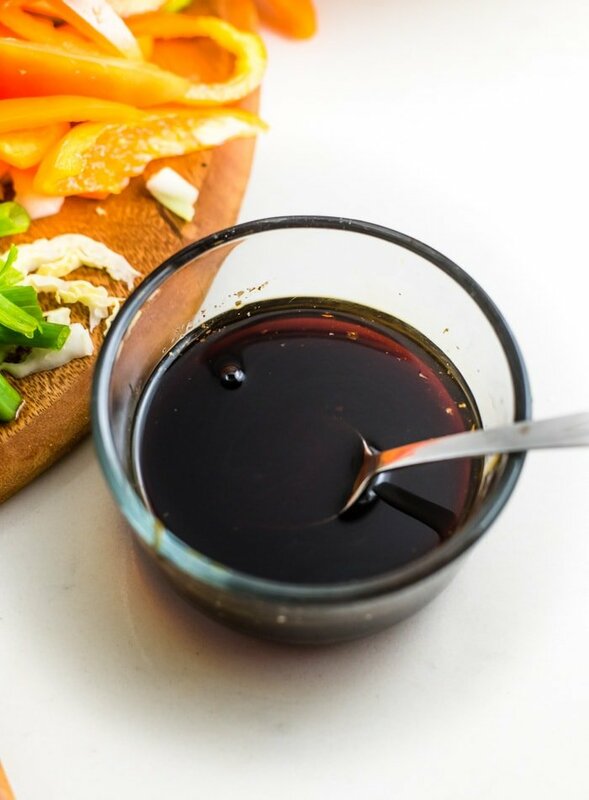 To make the sauce, whisk the soy sauce, maple syrup and hoisin sauce together in a small bowl. Set aside. To make the stir fry, add the cubed sweet potato to a wok or large skillet with about 1/4 of water, cover and let steam until almost fully cooked, approximately 7-8 minutes. Add the cabbage, garlic, bell peppers, carrot and green onion. Cook over high heat, stirring frequently for 6-7 minutes until the cabbage and peppers are cooked tender but not overcooked. Add the cashews when there are a couple minutes left (or reserve to use as a topping). If serving right away, divide between four bowls (on top of brown rice, if desired), top with the baked tofu and fresh cilantro and enjoy! Otherwise, store in the fridge in a container for up to 3 days. For a lower calorie stir fry, omit the cashews. Yep, you’ll see them listed at the bottom of the recipe! Thanks, enjoy!